How Financial Institutions can Leverage Technology for Competitive Advantage? 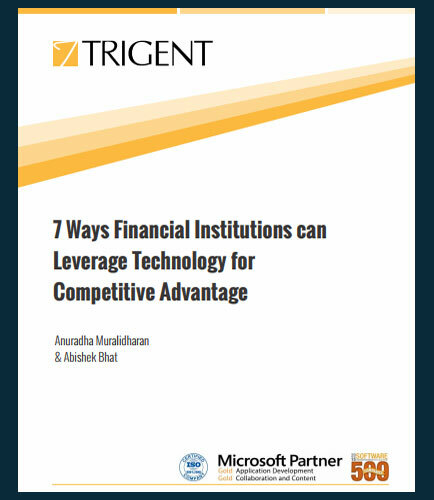 "How Financial Institutions can Leverage Technology for Competitive Advantage?" In the present scenario, financial institutions are tired of the proliferation of technology innovations. Unless, financial institutions are ready to replace or transform their IT architecture, their challenges in the next decade will be daunting. This whitepaper highlights the impact of technology failure and its crippling impact on a financial institution and how technology can help reduce risk, be more cost effective and provide strategic value. QuickBooks was designed by Inuit and the earliest version of this program was deployed in the year 2002 as QuickBooks Enterprise Solutions. It is a set of accounting software developed to help small and medium-sized businesses manage payrolls, sales, inventory and additional support for different typed of institutions. It features a different set of tools in its software to make the workload easier, such as marketing tools, training solutions, product and supplies, and other merchant services. Fintech stands for Financial Technology which is better understood as providing financial services by making use of software and modern technology. It was initially applied to consumer trade— financial institutions. By the end of the first decade of 21st century the term applies to any technological innovation in the financial sector.